We presumed that there had been some shipwreck in the vicinity, and that the poor woman had been pushed toward the coast, where she she’d got tangled up in the reeds. Only the Parisian shook his head. 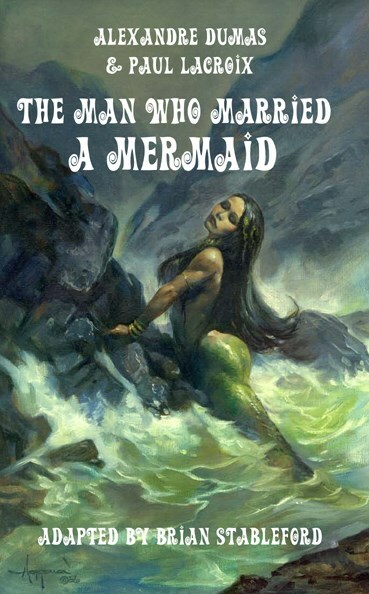 He said that he woman had fainted from fear on seeing us, and he claimed that she was a Nereid, not a shipwreck victim. The Man Who Married a Mermaid (1949) tells the picaresque story of a sailor, Père Olifus, who first marries a mermaid, then embarks upon a series of voyages to a semi-mythical Far East where he enjoys various economic opportunities, but remains plagued by the vengeful astral form of the mermaid wife he left behind. Master storyteller Alexandre Dumas teamed up with Paul Lacroix intending to produce a series of magical tales, of which this wry, sarcastic fable of supernaturally-punished infidelity was the first. When the project failed, Lacroix expanded the story into a novella, which remains entertaining as well as intriguing, and deserves to be reckoned one of the flawed classics of its genre.